It was a frigid morning and I had a feeling fishing would be tough today.The water, low like always, was around 44ºF when I arrived. It probably warmed a bit during the day, but I doubt it made it out of the 40s. These conditions can be a bit baffling. Low and cold is a tough scenario. I've caught fish on small flies (#10) on a sink tip, well sunk large tubes, conventional flies fished just under the surface, etc. Just about anything might work and there just isn't enough time left in the day to try it all. I fished two rigs today, a 9' 8wt. with a 9' mono leader an 11'3" 7wt. switch rod with a 460 gr. Rio AFS intermediate head and mono leader. I used a variety of flies, from relatively small, light ones to heavy copper tubes. I fished most of the day with only two bits of action. 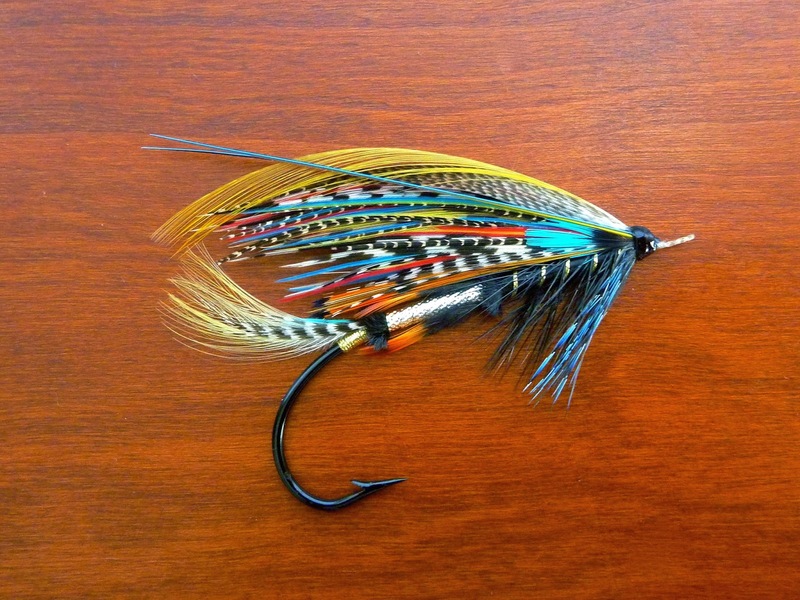 The first came on a classic salmon fly called "The Pearl." I desperately want to hook something on this fly. I tied this G.M Kelson pattern for Mike Radencich's latest book "Classic Salmon Fly Patterns" (p. 182). I've had success with a couple of classic patterns, but never with one tied on a blind eye hook. I tied a smaller version of the Pearl (#2) for fishing this fall. Today was the first time I had the opportunity to fish it. I swung it through a reliable lie. A salmon rolled for the fly, but I couldn't get him back. I decided to rest the spot and try again after fishing through the pool. The next pass went exactly the same as the first. I rested him again and fished through the pool once more. The third pass produced a strong pull from the salmon, but that's where it ended. I thought I was going to finally catch my first salmon on a gut eyed fly, but it wasn't meant to be. The only other action came just before dark. I had exhausted all the sensible options, so I figured it was time to go to the Frances. I tied on a Black Frances (1" heavy copper tube) and started casting upstream. I mended to get the fly down and worked my way down the pool. I've never had success with this approach before, but it's probably because I've never given it much of a chance. Well, it did produce a pull from a salmon, but nothing more. In retrospect, I should have tried the Frances approach at the other pools. In my opinion, it's not a very pleasant way to fish, but I'm starting to see the value of it as sort of "last resort" when the fish are in a sulky mood (as they were all day today). The H.M. Sunray, fished at light speed, is my typical last resort. It was totally ineffective today. The Francis is probably a good arrow to have in my quiver. No one I spoke with had any action, so I guess it was just one of those days. It's not the first and it certainly won't be the last. I think we've finally turned the corner in terms of temperature. From this point on, I will probably fish the vast majority of my flies lower in the water column. From mid-Spetember through the first week of November, I felt the need to sink a fly only on the warmest of days, in the fastest water…and even then only on a couple of occasions. So far this fall, almost 90% of my salmon hooked have been on a mono leader and an unweighted fly. It was a good run while it lasted! One day in Boisetown New Brunswick,I hooked and Landed 4 Salmon and and had a few misses,my Brother beside me didn't get a take All Day.The only difference was I had on a Sinktip leader and he had a Floating one.It was October and we were bothe using Ally shrimps.